Nikon has confirmed that it is committed to its new compact system cameras, the Nikon 1 V1 and Nikon 1 J1, with more lenses currently being developed. Speaking to TechRadar, Simon Iddon, product manager for the Nikon 1 system said, "It's a new area of business that is doing really well for us, you can't really ask for more from a first generation camera." One of the latest entries into the compact system camera market, Nikon's 1 camera use a smaller sensor than rivals from Panasonic, Olympus, Sony, Fujifilm and Samsung, but an extensive advertising campaign appears to be paying off. 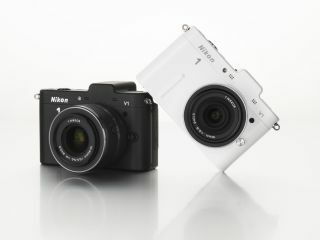 Over the Christmas period, the J1 was the biggest selling compact system camera on the market, something which Nikon claims it is maintaining at the beginning of 2012. "The smaller sensor was quite a bold move," said Iddon, "But it's proved to have paid off, and it was the right decision to make." At the launch of the Nikon 1, a number of lenses were shown to currently be in development to accompany the three lenses which were initially made available. "Nikon is completely behind the concept going forward, we're 100% committed," Iddon explained. Some have called for a more "pro" version of the Nikon 1, which involves more manual control and more function buttons on the body of the camera itself, but Iddon believes that some pros are already using the system. "Certain areas of the pro market are interested in it, people who are using it for wildlife and birdspotting for instance - they can use the existing lenses that they've got and get a much larger focal length on something which is a tiny body." Using a 200mm lens on a Nikon 1 camera (via the additional F-mount adapter which can be purchased) would give an equivalent focal length of 540 mm. This week, Jeremy Gilbert from Nikon UK told us that the idea of a pro Nikon 1 was being heard and fed back to Nikon Japan, so watch this space.